Luxury bell tents are becoming increasingly popular in this day and age. It’s a far more luxurious experience than staying in a traditional tent. You might well have tried glamping in a bell tent already. However, it’s not just glamping and luxury camping that a canvas bell tent is good for. You could buy a whole bunch of bell tents and use them for a glamping business. You might take one along with you on your next hunting trip, to give you those extra creature comforts you might want after a hard day on the trail. In fact, you might even try and get your hands on the best bell tent you can find and actually try living in it. The big question is, which is the best bell tent? Let’s take a closer look. The Dream House Bell Tent is available in a variety of different sizes. For couples and singletons, the 3-meter tent should be more than enough, although buyers should be aware that these smaller versions do not come with the stove hole – so no fire options! If you want to invest in the stove, too, you will need the 4-meter and 5-meter diameters. These sizes are perfect for larger families or those that love the camping lifestyle with friends. All versions of the tent come built with 3000 mm waterproof PU coating, so they are entirely waterproof without any further treatment or material. However, be aware that the cotton actually shrinks the first time it gets wet, as this is how it makes itself waterproof. Some users report a little leakage at this point in time, but it’s entirely normal – just be prepared for that first day or night of rain. Of course you could always season the tent at home, before your trip, if you have the room. The beauty of these bell tents is that they can be used all year round. There is a zippable groundsheet which means you can roll up the side walls when it gets hot, ensuring you have a nice breeze – you can also keep this open at night if you are brave enough. If there are too many bugs flying around, all you need to do is use the inbuilt mosquito screens to keep them at bay. There’s a reasonable amount of wind protection, too, but any windstorms more than six degrees of wind – around 30 miles an hour – should be avoided. In terms of price, as with most bell tents, there is a reasonable investment involved. However, given the fact this bell tent is durable, adaptable, still far, far cheaper than a weekend in a decent hotel, it’s certainly worth considering. It’s also important to point out that there are some clever little features to enjoy, too. For example, you can raise the PVC floor a few feet to keep yourself dry in wet conditions. There’s a simple little ring to hold your lantern, too. And, in case there is a high wind, you have the added bonus of being able to add supports both inside and outside of the bell tent. And finally, although it is a two-person job, the Dream House Bell Tent is straightforward to put up – albeit slightly on the heavy side to transport. The Dream House Bell Tent is not without its problems, but in terms of value and protection from the weather, it’s a solid investment – especially if you are just getting started in the glamping game. Even the smaller version feel spacious, and it will keep you safe in all-weathers. It is a shame that the 3-meter version doesn’t come with a stove hole, but those for whom fire is a must-have, the little extra you will pay for a larger tent will be worth it. The PlayDo 4-Season Waterproof Cotton Canvas Bell Tent is available in a range of different sizes from 3 meters to 6 meters. All come with a waterproof cotton exterior, stove pipe vents, electric cable holes and four screen windows and a framed door. The big question is, how does it stack up in the field? The most noticeable plus point of the PlayDo 4-Season Waterproof Cotton Canvas Bell Tent is that it is incredibly waterproof – in fact, we would even go so far to say weatherproof. Camping in incredibly fast winds and a reasonable amount of hard rain was perfectly safe, and although there was a slight amount of leakage through the windows, this is completely normal for a cotton tent as it goes through its waterproofing stage. It’s great in the sun, too. The tent provides exceptional shade, and with the windows open there is more than enough opportunity to let in as much breeze and air as is possible when the weather gets warm. The tent itself is exceptionally easy to set up – it should take you no longer than 20 minutes or so from scratch. And if you decide to invest in a stove, you are in for a treat. Most bell tents have side vents for their fires, but here, the vent is in the center. It’s a question of taste, of course, but for those looking for something different from the norm, this return to the yurt-style placement of the fire is a joy. That’s not to say it’s without its issues. The center pole could prove problematic to some, especially those with young or large families, who might want to keep that central space clear. Also, the guy lines are a little on the slippy side and a touch loose. While the PlayDo 4-Season Waterproof Cotton Canvas Bell Tent provided plenty of protection from super-fast winds, it did require a little TLC afterward – the guylines, especially, needed tightening. Not everyone wants to go camping in all weathers. And the very idea of glamping in 40-45 mph winds sounds ridiculous. However, the PlayDo 4-Season Waterproof Bell Tent held it together perfectly, albeit with a few tightening issues for the guylines the next morning. 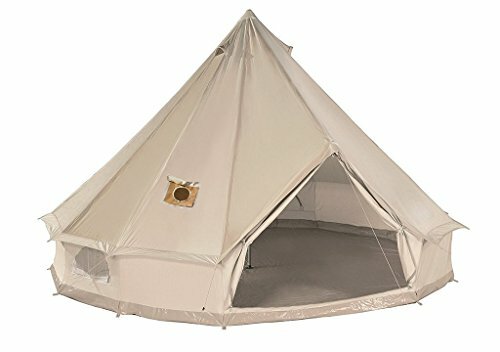 It’s great value, too, with all versions of the bell tent coming complete with the stove hole. 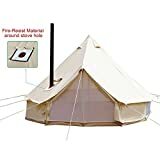 And, if you are willing to invest in a fire, the central location and top-of-tent vent is a nice design touch – just make sure you try it out for size before buying. 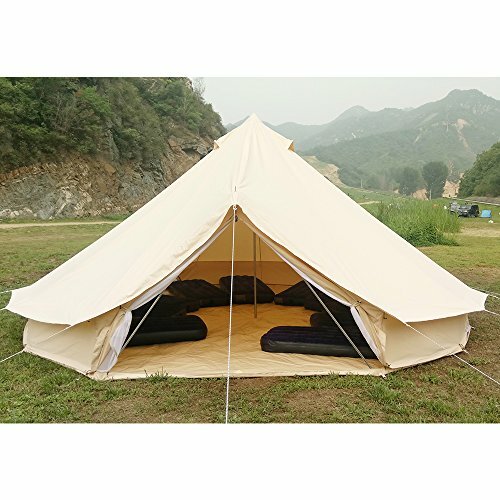 This cotton canvas bell tent is available in 4 meters and 5-meter sizes. 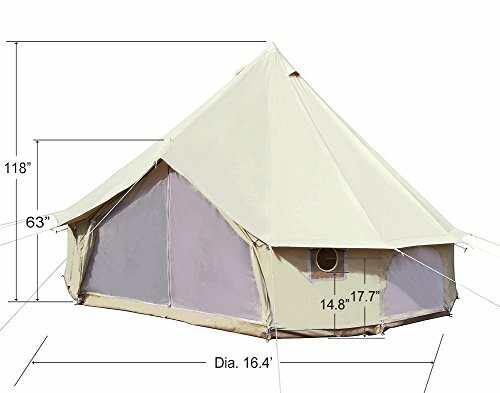 With foldable walls and a mesh screen to keep out bugs, a zip in/zip out groundsheet, and a two stove jacket, the DANCHEL bell tent is super flexible option that makes a great all-rounder, but is primarily a tent that is at the perfect price point for those looking for a great glamping experience. Why? Let’s take a look. More room than the TARDIS! When tested in the hard rain, the DANCHEL held up well – not a drop of water leaked through. This is an exceptionally waterproof tent, and there is plenty of space on the inside – think the TARDIS and you might be somewhere close to the actual spaciousness! Even the 4-meter version has plenty of room, and the tent can easily fit in enough camper beds to meet the needs of the average family. A few issues stop this tent from being awarded a perfect score, however. It is a little difficult to put up, and the instructions are unclear. Secondly, the zippers on our model were a little on the stiff side – although they may loosen up a bit over time. This DANCHEL tent is an exceptional product for anyone looking for a great glamping experience. Perfect for individuals and families alike, it’s simply brilliant value. And, although there are minor gripes about the zippers and complex setup instructions, these are problems that will dissipate over time. OK, so there you have it – three of the best and most popular cotton canvas bell tents on the market today. Each of them offers something different, and different types of camper may find one more enticing than the other. The big question is, which is best? It’s a tough call, but if you are looking for a great tent for glamping – or even living in – and a great price, the DANCHEL just shades it in our opinion. This is one of the best glamping tents available just make sure you leave aside enough time to set it up before it gets dark! If you’re looking for more information on canvas tents in general, then read our buyers guide.